It’s that time of the year again! Back to school time means the threat of lice returns just as soon as the kids hop off the bus. If you’ve had an unfortunate encounter with lice, learn how Eco Tech can help you in your fight against this most annoying and distressing pest. Did you know that lice don’t only invade in schools? You might also contract lice in places where close contact can occur such as locker rooms, cars, camps, furniture, and coat racks. 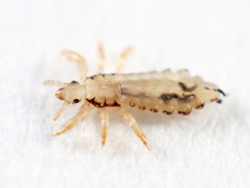 While they don’t tend to live long when they are without a warm-blooded host, lice do manage to spread quite quickly. Lice can be extremely difficult to get rid of, so you’ll not want to waste any time in your fight to eradicate these pests. You’ll want to get rid of lice first by seeing your doctor. Your doctor will be able to advise you on the proper treatments that will effectively kill lice and their nits. Those treatments will likely involve a plan that includes combing, using medicated shampoo, rinses, and/or lotion. It may take some time to finally get rid of your lice problem, and it will require diligence, but rest assured that you will succeed. Lice cannot live more than a day or two without a host to provide a blood meal. The female head lice can lay around 7-12 eggs, known as “nits” each day. It is common to find these small white nits near the scalp, attached to hair. In about 7-11 days, the nits will hatch. However, the nits can’t hatch if they are not located on a human host. Should You Treat Furnishings For Lice? Chances are, you won’t need to treat your furnishings such as carpeting, bedding, and upholstered furniture for lice. In the event you do find lice on your furnishings, remember they won’t live more than a couple days, and nits won’t hatch without the warmth and blood of humans. If you’ve gone through the process to eradicate lice from your hair, or if you are currently fighting the battle against lice and feel you would like to call in the experts, Eco Tech will provide you with a consultation and inspection of your St Paul home. Our less toxic and organic product line is safe to treat the interior and exterior perimeter. Call us today at (763) 785-1414 for your St. Paul lice exterminator inspection.